School of PE is proud to serve as an exam review course provider for military personnel. We have had military students from all branches prepare for NCEES exams by taking our FE, PE, and SE exam review courses to further their engineering careers. We appreciate everything our military does for our country. To thank you for serving our country, we are happy to offer a $100 discount to members of the military. This discount is available to active duty military members. In order to receive the military discount, first register for one of our exam review courses. You can register online or by calling 614-873-7475. After you register, scan and email a copy of your military ID or official military orders to info@schoolofpe.com. 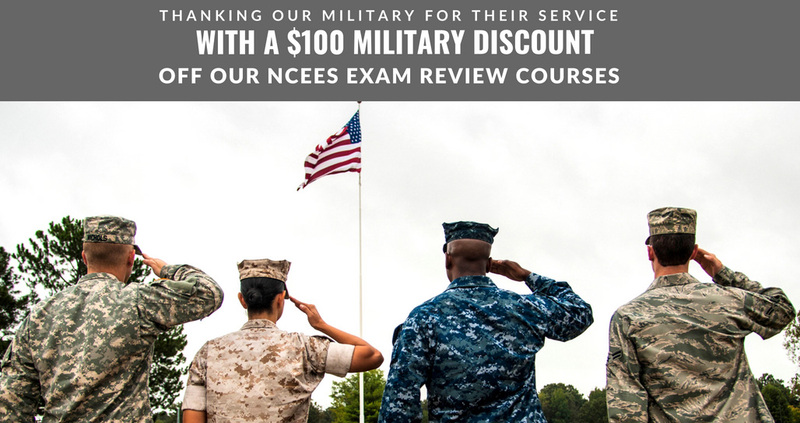 Once we verify that you are eligible for the military discount, you will receive a $100 discount off your exam review course. If your payment has already been processed, you will receive a refund of $100. Please note that the military discount is not valid on our monthly subscription courses. We offer special group pricing for military personnel. If you are interested in registering a group of military personnel, please contact us by emailing info@schoolofpe.com or by calling 614-873-7475.